Brix Rockstone is no stranger to Packing his Pack with all the treasure and loot he and his adventuring party can find. 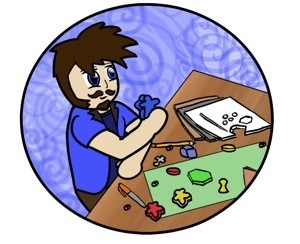 Brix joined the Pack to do all the dwarfly things- find gems, take gems, wrestle for said gems, pry gems out of cold dead fingers of fellow party members… you know, the basics. Brix returned to the family bussiness of mining, and in his anger and frustration immediately dug too greedily and too deep. He began fusing gemstones directly to his hammer to create a more powerful mining implement and dug through dirt, rock, and stone like a man possessed. As the hammer became more and more powerful it lead him like a siren through the rocky caverns and tunnels as though responding to some unheard call to hammers everywhere. Brix mined a path through the very bonds of time and space until he cracked a vein open and discovered he had mined upwards into a strange room underground fitted with strange artificial grass. Shaken as if from a dream, Brix realized that the pathways had closed behind him and he was trapped in this unusual world. He pondered a moment to think if perhaps he ought to have stuck with adventuring. 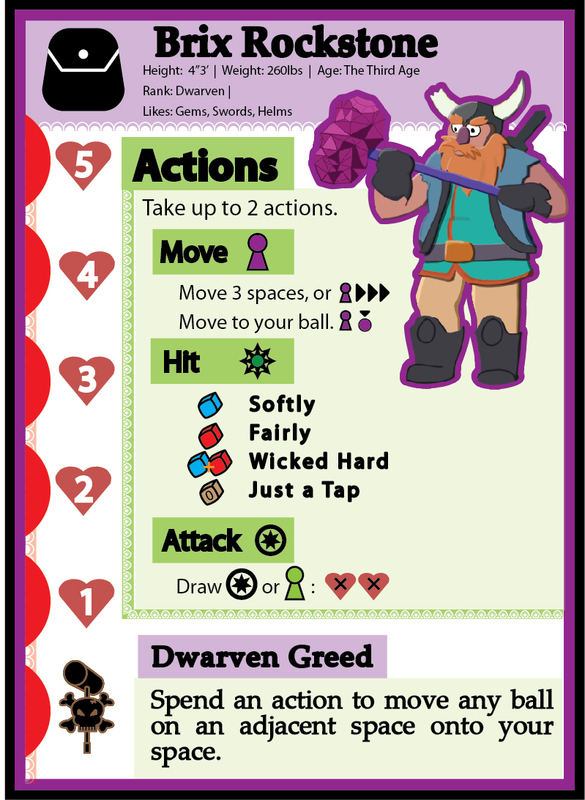 Dwarven Greed: Spend an action to move any ball on an adjacent space onto your space. Brix wants it all and he wants it now, using the gemstone attraction (?) in his hammer, he is able to pull other balls to his space. An important ability should he require a way to pull his own ball into line with a target, or should he want to pull an opposing ball off course. At the right time with the right aim, Brix can use his ability to devastating effect on the croquet lawn. However, it also draws folks to him, possibly angry folks (certainly angry folks), best of luck Brix Rockstone.